I want to get a prayer warrior team together that can dedicate some time to us specifically and frequently. Then I can send requests and know that they will be taken care of. Our group here just doesn’t have the belief and faith strong enough for some of the things I want to be prayed about – so they go through the motions, thinking I am crazy and the prayers are not of conviction. This is one of my major prayer goals; that our members will open themselves totally to God, not just part way and selectively. We covet your prayers and your support and praise God and thank him for all of you. John, Maeo and all of us here at the Christian Mission. I thought it might be time to start introducing some of your children to you, so you can put faces with names especially when we ask you to be praying for them. Next are two of our very young ones. The one of the left is Annie and the one on the right is Muk. Annie’s mother has accepted Christ – far right in the picture – but neither her husband nor three children have accepted Christ at this point. Annie is in Kindergarten and Muk attends the village pre-school. 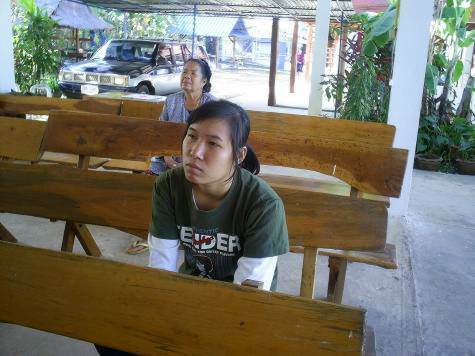 Muk’s older sister, Dao was a regular attendee here for several years, but recently turned away, she has not accepted Christ either. Dao is in grade 9 this year. 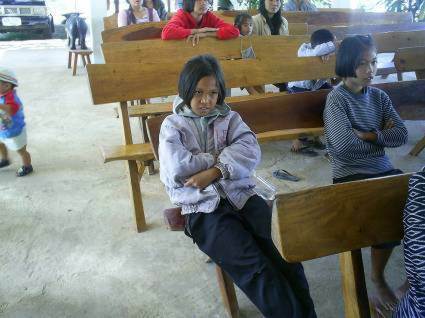 She attends the high school in town, and is quick to admit that she has not accepted Christ. Please pray for her too. Next we have three sisters – part of a family of five that are being raised by their grandmother. They have parents, but they are out working most of the time; taking on whatever kind of jobs they can get to bring money into the family. 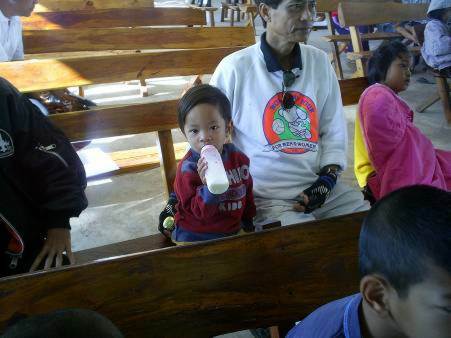 Cape is one of our younger attendees; he is sitting with his grandfather,Dtee who is Maeo’s brother and a Christian, however his wife had turned away from God. 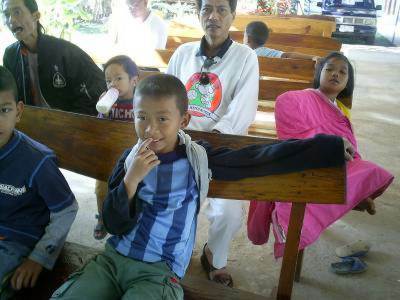 Cape’s mother and father have been baptized but do very little to support the church and are not regular in their attendance. Dong is in the center here on the right. He is new to the Christian Mission. He is a 4th grader at the local village elementary school. He was invited to attend by his friend sitting next to him – more on the friend next. Dong lives with his mother and grandmother – father is out of the country working. Next we have Op. He looks like a first or second grader, but he is in the 5th grade at the local school. He lives with him mother and grandmother who sometimes attend church but are not believers; at this point he has not accepted Christ either. He helps his mother sell Thai soup when he is not in school. Grandmother recently had a foot removed because of diabetes. She was given an artificial foot, but refuses to use it and refused to follow the doctor’s directions on diet and exercise. Her main activity, I believe, is just lying around waiting to die. 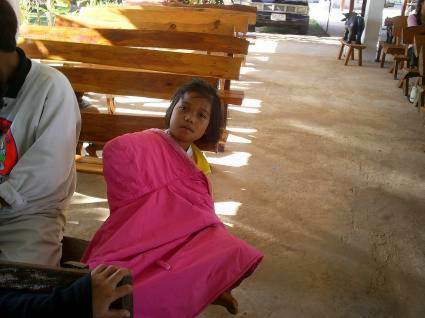 When she was sick, she came to church. Once God healed her, she has departed. Next in our parade is Dtong. 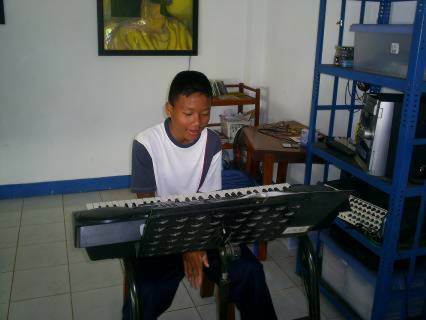 He is very versatile and acts as song leader, computer operator, keyboard specialist and we learned this Christmas that he has a very good voice for singing solos also. He is in the 7th grade and looks like about a 4th grader. He needs a lot of prayer in that he has not accepted Christ as of yet. He knows all the right answers in his mind, but it isn’t to his heart yet. After Dtong come Gook Guy and Bo Bpae. These two are both 5th graders and participate in our programs here at the church. Bo Bpae claims she has accepted Christ but will not talk to her parents about it; her older sister has accepted Christ been baptized and now left the church. Gook Guy was a student of Maeo’s back in kindergarten; she attended Christian mission, left for several years and is now back. She also has not accepted Christ as yet. Next we have Kim. Kim is in the 12th grade. She has accepted Christ, been baptized and is a very active member at Christian Mission. In fact, she does much of the janitor work for the mission. 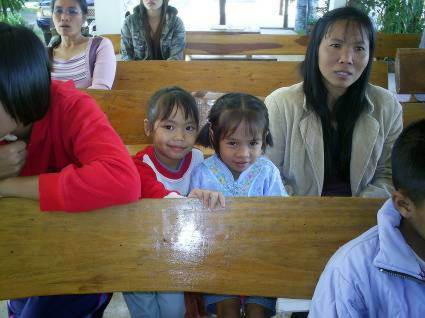 Currently she lives at the Christian Mission with her older sister who is an outpatient under care at the local psychiatric hospital. Their mother is dysfunctional and on her third or fourth husband. Kim’s life was a mess and without hope until we ran across her in the 8th grade. She had no plans of going beyond 9th grade; now she is planning 2 years continuing at junior college. Praise God for Kim. Om is the son of Nong, our first mother to accept Christ. He is the next to the youngest – they have three children. No one else in the family has accepted Christ and Om comes when there is nothing else to do. Om on left. Pao. She is a third grader. Mother was a student of Maeo’s several years ago. The child is a slow learner. She lives with her grandmother and the grandmother sends her here on Sunday and wants us to help her granddaughter become a better student. After that is a 7th grader named Naan. Naan has been with us for several years. Her father is waiting for a heart transplant, mom is out of the house working so grandmother takes care of Naan and her younger sister and brother. 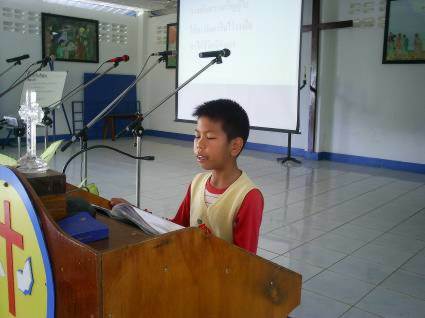 Naan is also an English tutor for the church and receives a scholarship to assist with school. Nam is one of my favorites. 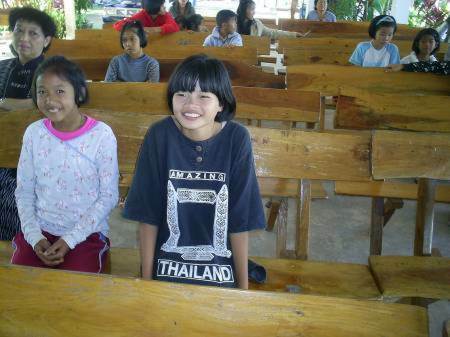 She is an 8th grade students and one of the children that were provided with a new life through the Thai Lao Cambodia Brotherhood. We first met her at the end of sixth grade and she was not expected to come back to 7th grade because she was expected to die. She had heart problems and TLCB was able to foot the bill for her to go to Khon Kaen for surgery. 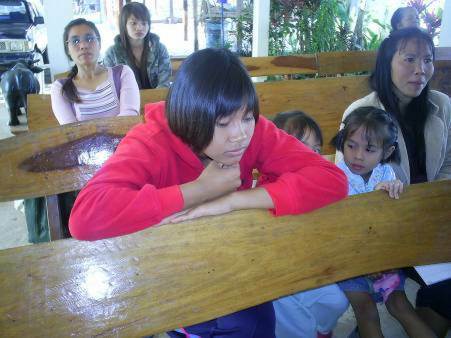 She is now a new young lady and her recent heart checkup was all okay, praise God. 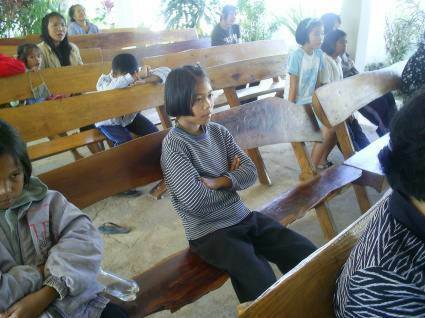 She is new – about 1 year old – and the Christian Mission but she is growing. She is an English Tutor, a game leader, learning to cook, and acts as our announcer at special activities. Noon. He is one of our newest students. He is a 5th grade student and he and his sister have just started coming. His father is a day laborer here at the Mission and has been working for us now for about 2 months. His father is an Amerasian – American father/Thai mother, one of the several thousand children left here by our troops when they visited here in the 1960’s and 1970’s. Noon and his older sister live with their mother and father and the father’s mother on the edge of a village about 10 km from the mission. 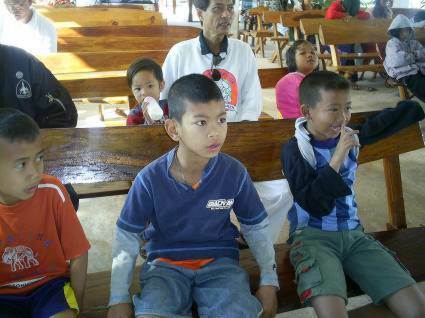 Please pray for Noon and his family that they will come to know Christ. A side note- we have located the man that we believe 95% is Noon’s father’s father. Up to this point he has denied it; please pray that the truth will win out in this case. God has blessed us in re-uniting one father and his daughter. 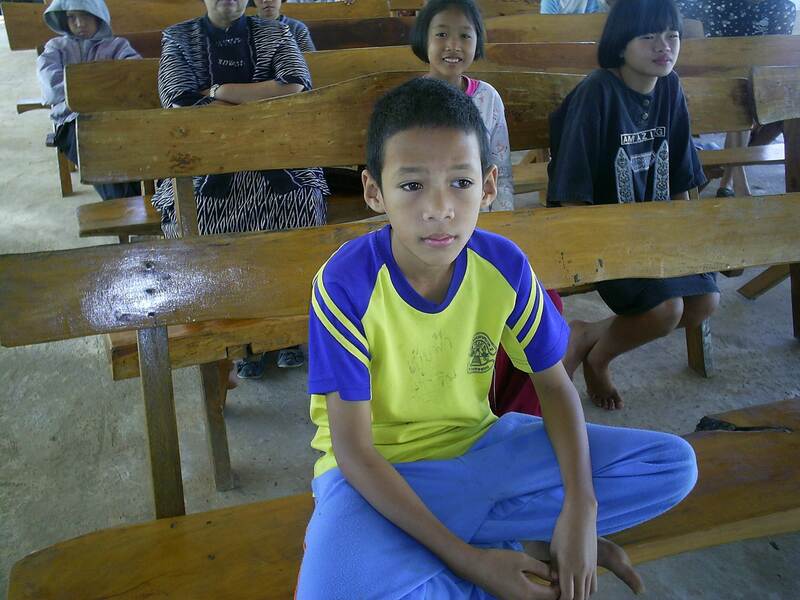 Next we have Olay – This is the oldest son of Nong. You read about her next son, Om above and her littlest child, Annie further up the list. 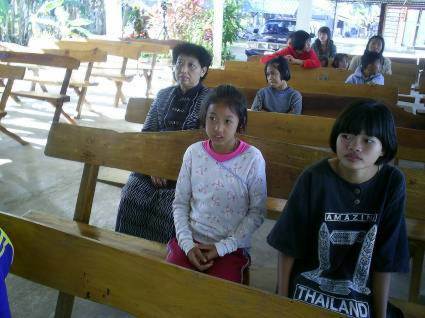 None of Nong’s children have accepted Christ. Olay is in the 6th grade along with Op and Bpuen, and they are all in the same boat. They come from very poor families located in the middle of spirit worshiping families, some of whom are possessed by spirits regularly; we ask for your prayers for him also. Next we have Oy. He is in the 5th grade along with Op. He lives with his mother, father and younger brother and sister. 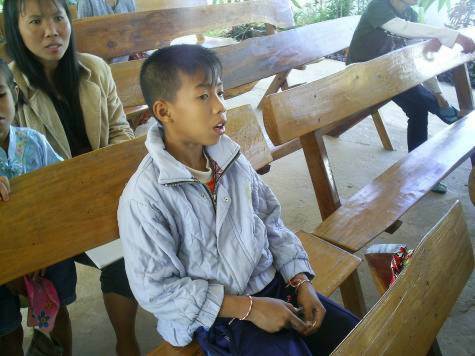 His mother and father attended church for a while but when they could no longer get money from it left; mother still comes back once in a while. Oy has been coming and participating for about 4 years now, but still is afraid to firmly accept Christ – he is afraid of what his friends will say and what he thinks his parents might say. Next, we have Quan. She is the older sister of Noon, talked about above. She is in the 7th grade. Her grandmother wants her to begin attending Christian Mission every Saturday and Sunday to improve her study skills and receive discipline . Both Quan and Noon are a bit wild and need to reduce their energy level a bit. Quan is on the right.